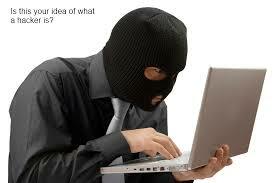 2) The term hacker is used in popular media to describe someone who attempts to break into computer systems. Typically, this kind of hacker would be a proficient programmer or engineer with sufficient technical knowledge to understand the weak points in a security system. For more on this usage, see cracker. "1.a person who uses computers to gain unauthorized access to data. 2.a person or thing that hacks or cuts roughly."